A honeybee, Apis mellifera: Bees play a critical role in pollinating almonds, blueberries, apples, cherries, oranges and other crops. A 2010 study estimated that the seeds and fruits created by honeybee pollination were worth $29 billion annually to American agriculture. Yet honeybees are under assault from pesticides, mites, habitat fragmentation and the mysterious but deadly "colony collapse disorder." 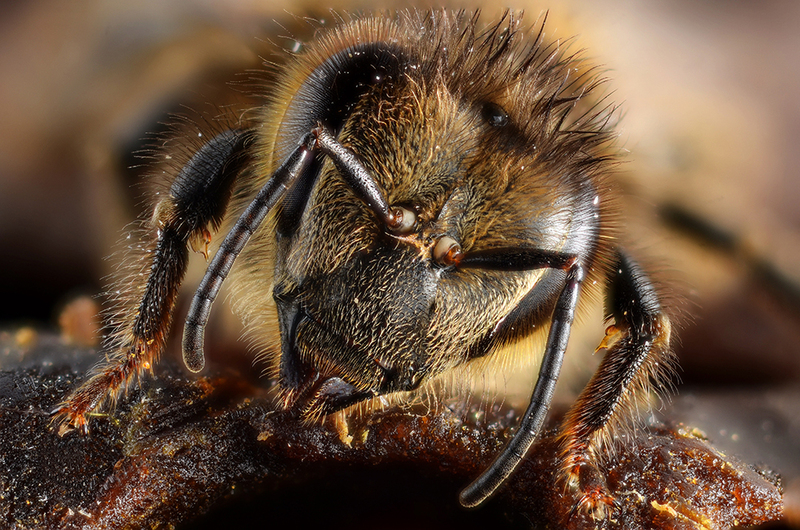 In a survey of more than 6,400 ceramic vessels from across Europe and the Middle East, scientists have found what they call "widespread" traces of the complex and durable organic material beeswax, a product of the honeybee Apis mellifera. "Detecting beeswax in pots allows us to say that early farmers were exploiting hive products (beeswax and honey)," Melanie Roffet-Salque explained in an email to us. Bees make beeswax for honeycomb; the structure in the hive that holds stores of honey and developing bee larvae. Roffet-Salque, the first author of a paper in this week's Nature1 works with Richard Evershed at the Organic Geochemistry Unit at the University of Bristol in the United Kingdom. The oldest sample of beeswax came from a ceramic cooking vessel from Anatolia fired more than 8,000 years ago. Because pottery was invented about this time, this study could not find older traces of beeswax. The human relationship to honeybees dates to 38,000 BCE, based on a sample of beeswax from South Africa, Roffet-Salque said. All told, the researchers found about 50 examples of beeswax, enough to document broad usage of honey and beeswax in Neolithic Europe. For unexplained reasons, the biggest concentration of beeswax samples were found in the Balkans. Production of silk, another material from an "exploited" insect (the silkworm), originated in China during the 4th millennium BCE. Researchers have identified beeswax residues left on Neolithic pottery artifacts over much of Europe. 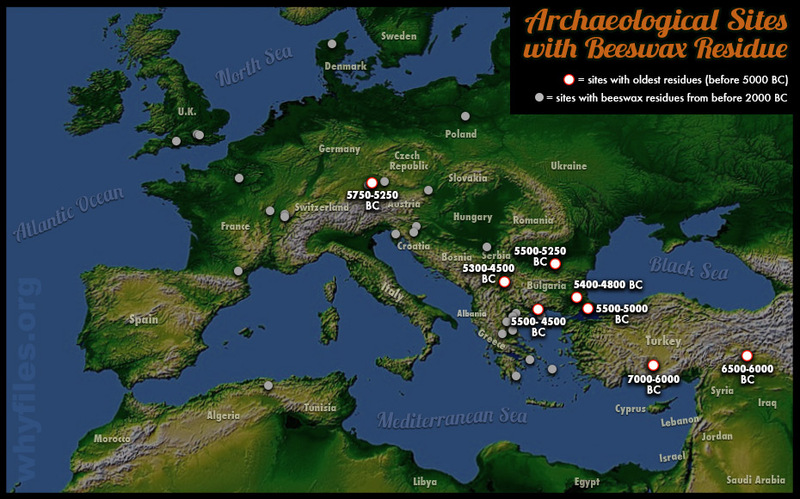 The apparent exploitation of beeswax by Neolithic farmers was occurring 8,000 years ago in Turkey, and several other sites, as shown above. 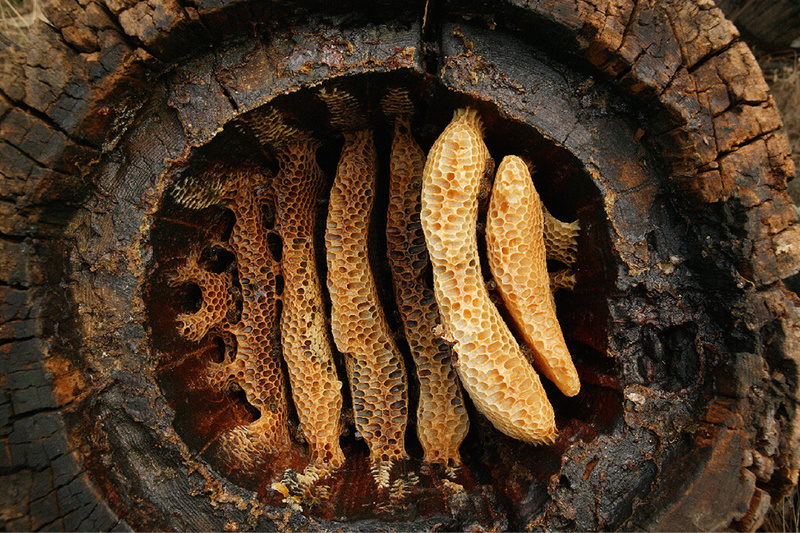 A hollow log hive of the Cévennes in France reveals the circular comb architecture in Apis mellifera. "Honey is The most obvious reason for exploiting the honeybee," Roffet-Salque wrote, "as this would have been a rare sweetener for prehistoric people. However, beeswax could have been used in its own right for various technological, ritual, cosmetic, medicinal purposes." Some of the earliest depiction of honey bees are found in Egyptian iconography such as these honey bee carvings adorning the Temple of Karnak, Egypt constructed around 1400 BC. For example, beeswax may have served to waterproof low-fired ceramic, or been compounded with other materials. Beeswax would “soften the brittle birch bark tar to make glue (we have sees traces of birch bark tar in an Iron Age French site)," Roffet-Salque says. The scientists used a gas chromatograph to identify organic molecules in beeswax, says Melanie. “Honey cannot be detected directly as it is mainly composed of sugars (carbohydrates) which are very soluble and do not survive through archaeological times. Beeswax is composed of a complex suite of compounds that are largely resistant to degradation." It’s not clear whether the ancient farmers were raiding beehives in the wild, cultivating bees, or both, says Roffet-Salque. “We have shown that farmers were exploiting bee products at that time, but we cannot really tell if it was honey hunting or beekeeping." What is clear, however, is that the wax came from A. mellifera, often called the European honeybee. "The chemical compositions of beeswax from different bee species are slightly different. We are thus pretty confident that we have only detected beeswax from A. mellifera. And it makes sense with the distribution of Apis species we know today." Polyandry: Bees do it. What’s the big advantage? Bees: When in Doubt, Eat like a Copycat!